The Oxwood Inn is missing its “O.” It’s hard to say how long it’s been gone, but no one bothered to replace it. The bar itself, a windowless dive sitting across from a Subway on a quiet stretch of Oxnard Avenue in Van Nuys, hasn’t had a facelift since it was purchased in 1972. Bought by Texas-born Betty “Tuck” Sutherland, it was the longest-running lesbian bar in the United States, as well as one of the only places transgender women could feel safe and welcome—until last weekend, when it closed its doors for good. Dubbed “Menopause Manor” for its demographic—middle-aged women, many of who lived in the Valley—the Oxwood was Cheers for the lesbian working class. Two electronic darts games greeted visitors upon arrival, and a sparsely populated case offering “Bro Dart Accessories” was on the wall, looking like it hadn’t been opened since the 1980s. The place was a time warp—rarely was anyone preoccupied by their phones (at least not for noticeable lengths of time), and the old school décor included a framed portrait of Marlene Dietrich and a large art deco mirror hung on faux bois white walls. In short, it was a far cry from the purposefully decorated, dimly lit dive bars you’ll find in Los Feliz. What once began as a lesbian bar turned into a queer catch-all—the opposite of the swanky, trendy clubs of WeHo with bathroom attendants and celebrity guests. And now that Club Shine is no more, transgender patrons are feeling particularly affected (though rumor has it the club night will be relocating in the future). The event was “a little bit hit-or-miss” at first, according to Laura Espinoza-Lunden, a trans promoter and musician, but it eventually grew into a full-blown movement. By the end of the first year, “it took off,” she says. 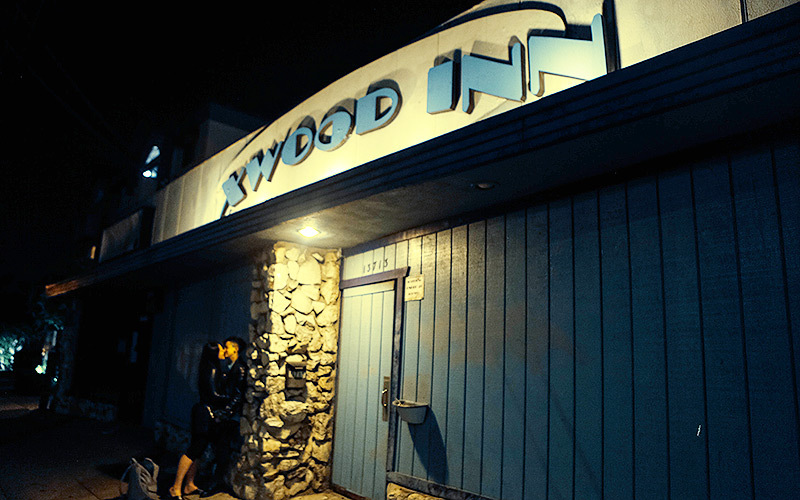 “It became a home for the community.” In the end, Club Shine is what kept the Oxwood afloat for the last decade. “We would have been bankrupt long before,” Stadler says.